Before we talk profiles, it’s important to understand the basic Buffer concept for Demand Driven MRP. At the core are the intuitive 3 zones … Green (plenty), Red (Problem) and Yellow (Build or buy more). You’re familiar with the typical inventory sawtooth pattern of inventory being consumed then replenished … well, we’re looking for that pattern superimposed on the zones. So for example, Inventory at TOG (Top of Green) is consumed until it reaches Yellow … which means it’s entering the rebuild zone and any time after that, an order should be placed. If the inventory reaches Red, that’s the expedite zone and someone needs to move heaven and earth if necessary to get inventory in before there’s a stock-out. 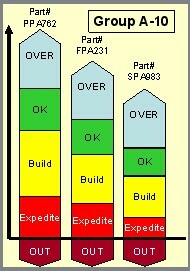 Now, in the original form of this Replenishment model, the Green, Red and Yellow zones were equal. But in fact, it makes much more sense to consider the elements that have an effect on the size of the 3 zones; for example, if a part has high variability it probably makes sense to have a larger Red zone than just 33%. So we have two things in play here: the relative proportion of the zones, and the actual quantity (stock levels) involved. It’s the relative proportion of the zones that is considered to be the Buffer Profile. Now, it’s neither practical not necessary to have unique profiles for every part; we group them into common profile characteristics. 1. The type … purchased, manufactured, or distributed. 4. Whether the Minimum Order Quantity (MOQ) is significant. Now, one group might be (for example) Purchased parts with long lead times and high variability. Another, Manufactured parts with medium lead times and low variability. The parts within a Group might have no other connection with each other beyond the common characteristics that place them within the Group. And, the actual quantities associated with one part’s Buffer in contrast to another’s can be very different. To determine the levels, we can apply both Group Traits – traits related to the Group as a whole – and Individual Traits. Group Traits include the order cycle, demand variability and supply variability. Individual traits include average daily usage (ADU), which is a smoothed calculation over a carefully chosen time horizon; fixed and cumulative lead times; minimum order quantity and etc. The average daily usage is a key data point. For example, the “standard” Yellow zone calculation is often based on the ADU over the lead time, and the Green and a portion of the Red zone (the Red Base) are similarly calculated with reference to the ADU. The other portion of the Red zone addresses safety stock, and is influenced by variability.